The political mainstream is in a deep crisis, claim scholars and pundits. But how can we define which political parties belong to the mainstream, and how can we measure their electoral success or decline? At the annual conference of the Political Studies Association (PSA) in Glasgow on 11 April 2017, I presented the first results of his research on this issue in the framework of the RESuME project. The presentation can be summarised in three main steps. First, the concept of the “mainstream” is ill-defined in the politological literature and intrinsically elusive; nevertheless, at least five indicators of “mainstreamness” can be derived and streamlined. Secondly, the evolution of the voting behaviour in Western Europe (15 countries) from 1989 to 2016 points to a substantial (albeit uneven and not yet catastrophic) erosion of traditional mainstream parties, which are still usually able to hold on to power through majoritarian electoral laws or increasingly heterogeneous coalitions but, according to some measures, are often barely above the bar of 50 per cent of valid votes. Thirdly, the explanation of this decline is complex, but the poor performance of EU economies (particularly the 1991-3 crisis and the ongoing post-2007 depression) and the decreasing effectiveness of the mechanism of left-right governmental alternation play a role in it. The erosion of traditional mainstream parties is likely to continue in the coming years, leading an increasing number of challenger parties to power (in coalition or alone). However, this will not necessarly lead to major policy shifts, as “extreme” challenger parties remain a relatively small minority of all challengers and as EU and international constraints have so far proven quite effective in “taming” their heterodox visions (e.g. in Greece). 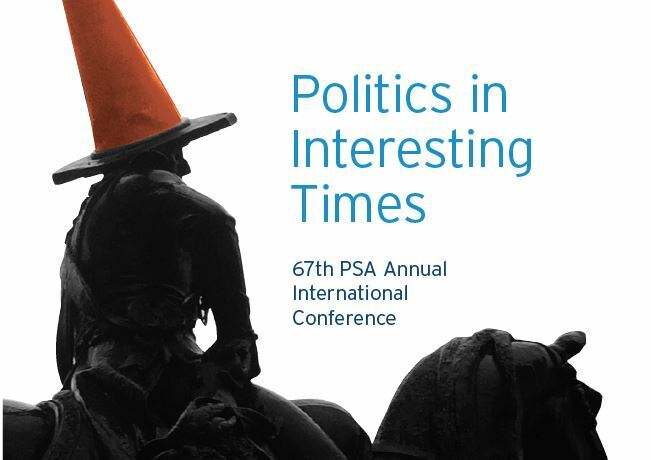 The 4-day conference, titled “Politics in Interensting Times”, featured more than 150 panels on UK politics, EU politics, political theory and methodology, political economy, and other political issues. Notable events included an evening speech by Scottish first minister Nicola Sturgeon, who outlined her case for Scottish independence, a lecture by Professor Mark Blyth (Brown University), who explored the “politics of a secularly stagnant world”, and a keynote speech Professor Pippa Norris (Harvard University), who discussed her interpretation of the rise of populism as rooted not in economic insecurity, but on authoritarian values.